The game is horrible now, wtp is happening . Maintence, but no news about how long it lasts ? Looking forward to do the rune event, it's hella good . Now it's really horrible, just doing dojo and the game start to freeze a lot. It's been this way for a week. 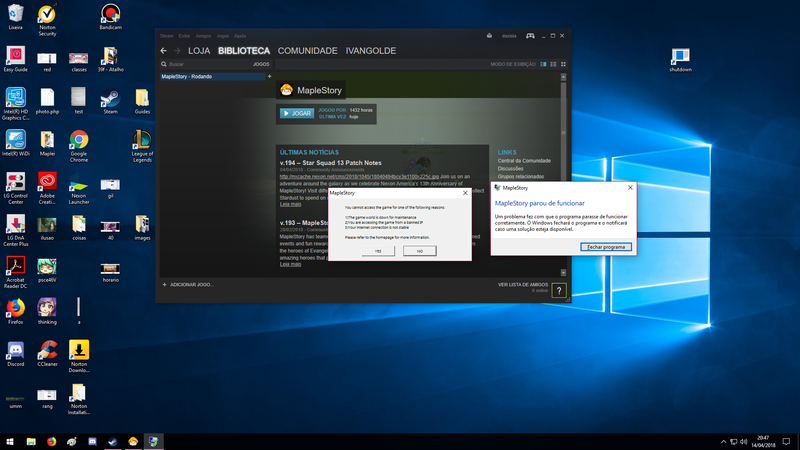 At one point they disabled the giftbox notifier, of all things, and it seemed to cure the connectivity issues. Then they re-enabled it, and the issues gradually returned. So then they disabled it again - but this time it didn't help at all. Now we wait for them to figure out what is really going on. Just because it was stable . lol rip CRA. Channel is completely down in Scania. Edit : Oh when did CRA become any channel? Regardless 13 and 14 down. Maintenance, rip lv239 , i was expecting this, got some exp at least. I don't even know if I'd call it "maintenance" since there's literally nothing on the site and the whole place is on fire. Good point, just used to say that when the game is down. It's or the game is now unplayable? I have massive frame drops everywhere! Looks like login servers are down tonight. Pity, was hoping to at least get some dojo runs done before hopping off to bed. One out of three is still up. You can get in if you keep trying. wtp is happening to me? Maybe now close for the uptate to come? Looks like another bit of unscheduled downtime from the Discord server. Dammit, just when I was looking forward to clearing a few dojo runs. Last edited by klimbo; 2019-02-21 at 02:55 AM.